Renovated April 2018! Free beach chairs March - October. New carpet, refrigerator, microwave, new bunk beds, dresser, lamp in Bonus room. New shower head and curtain in hall bath. New King Pillow Top Mattress set in MBR and new shower head in MBR bath. All lighting upgraded to LED. 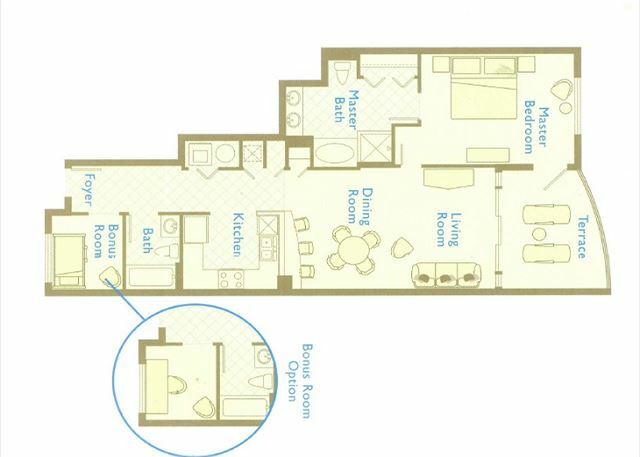 Make your vacation dreams come true in this 4th floor, 1 bedroom/2 bath Aqua condominium, with bonus bunk room. This middle unit provides stunning views of both pools and the Gulf of Mexico from your private terrace. The tastefully decorated interior spaces include full kitchen with granite counter tops, refrigerator with ice maker, microwave and laundry with washer and dryer. The elegant master suite, with private terrace entry, features a separate glass enclosed shower, garden tub, double vanity with granite counter tops and generous closet space. Furnished by a professional designer, this Aqua condominium will provide a memorable vacation for you and your family! Condo 0406 is nice. The only complaint I have is the Blue Chair is not comfortable to sit in! We loved our 2 day stay and would love to return but are waiting to hear about the status of our refund due to the Michael evacuation. We should be refunded for the dates of 10/9-10/12. We would love to apply that refund towards our stay next fall, if possible. Please advise. we had beautiful weather. but had problems with parental controls on the tv. The office said they would have to contact the actual owners of the condo.And I felt like the condo could have been a little cleaner. the floors were dusty and the shower was dirty. Our stay at the Aqua was outstanding. The unit we stayed in was very clean and well maintained. It is very convenient to all of the restaurants and attractions. I would highly recommend staying at the Aqua to a friend or relative. We plan to come Beach and stay at the Aqua next summer. Great place to stayand the location is great! We have stayed at the Aqua Condominium a number of times and we have enjoyed it every time. Easy walk to Pier Park and places to eat. We will stay again! Great time at Aqua as usual. Our first stay At the Aqua Resort was very pleasant and enjoyable. Room was updated and very clean. Loved the location and the services we received from the patrons on the beach, were fabulous...very courteous and took great pride in their work. Will come and stay again. This was our second stay at Aqua. It has been a very nice, clean, quiet and convenient place to stay. It is family friendly. I would highly recommend. All was good and cleaned! Might come back next year.